Tablets are great for work, play and so many more opportunities but holding it while doing stuff is not always what is you want and that is why this tablet stand is what you really want. The Levo G2 Deluxe tablet stand will hold many devices from small ebook readers all the way to an iPad Pro or Surface tablet. The tablet stand comes on a wheeled floor base so that you can move it easy around and can be adjusted between 30 and 56 inch in hight and the side arms fold and the holder swivels so that you can really make the position you want. Perfect for watching a movie in bed or use it as a computer screen in the office. Just check out the video below to see how versatile it is. So now you know it could work for you so just get this amazing tablet floor stand and put you tablet in. Come get your LEVO G2 Deluxe Tablet Stand. 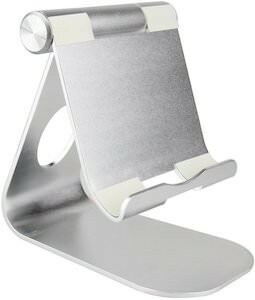 This tablet stand is adjustable in angle so that you can use it for many tasks at home or work. And this tablet stand is made for the iPad Pro so even the bigger tablets will fit perfectly on the stand. Made from aluminium the stand really looks nice and it works with so many tablets besides he iPad Pro. iPad mini, iPad Air or even Android and Microsoft tablets will work on this great looking stand that is there to help you get the perfect work environment. And on the tablet stand you can put you tablet in horizontal or vertical so that it really works for almost all your tasks. Come check out this Aluminium iPad Pro Tablet Stand. If you have a tablet then you know the feeling of holding your tablet while lying down and trying to watch or read something and it’s not very comfortable. 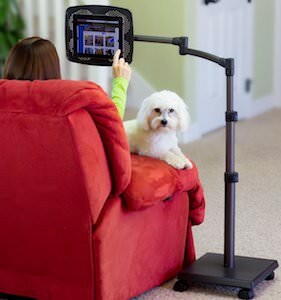 But now there is the Tablift a stand for almost any tablet that can hold you iPad or Android tablet for you. The stand has 4 bendable legs that you prop over your body making it the perfect way to watch your tablet. Now watching a movie in bed is so easy that you can say bye bye to your TV. 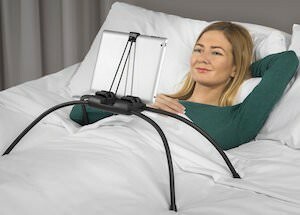 The flexible legs are not only perfect to make the perfect position of your tablet they also fold down a lot so that the Tablift does not take to much space when not in use. 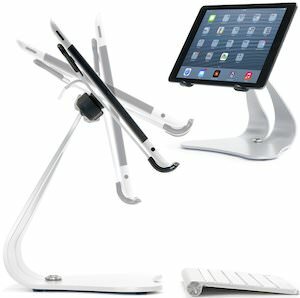 Come take a closer look at this Tablift Tablet Stand. So you are looking for the perfect stand to make you tablet into more like a “normal” computer or point of sale display. This silver tablet stand will fit many tablet in the 10″ range like the iPad Air, iPad 3e and 4e generation and yes the iPad 2 and first generation iPad will all fit perfectly on this stand. Many tablets from other manufacturers will work fine on this stand to. You can use this tablet stand in landscape and portrait and the tablet can pivot while on display so that you can create the perfect angel for your work. Come see this amazing looking stand and when you do so expect that you want one. 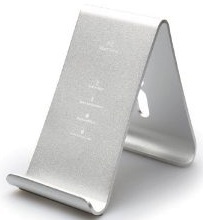 So click now to see this Pivoting iPad And Tablet Stand. We all know the problem, where do you put your phone while driving. Sure there are sticky matts and strange holders but non seem to be perfect unless you pay a lot of money. But now there is the nGroove MT5000 from Mountek. This holder will hold you phone securely in portrait or landscape and does not need any drilling or other harsh ways to connect to your car. The nGroove just fits in the CD player of your car. Just slide it in and tighten the screw and you are good to go without damaging your radio or your car. And you can turn the holder 360 degrees so that you can put it to your desired angle and it even swivels a bit so it can’t get more perfect. And most phones just fit in the holder like it was made for it and when you remove it just press the button and the holder opens. It doesn’t matter if you own an iPhone, Samsung, LG or HTC phone it will fit don’t worry. 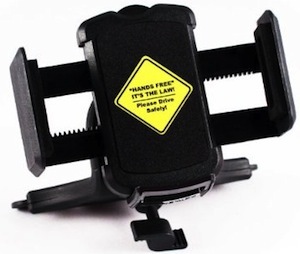 Come and read more about what people say about the Mountek nGroove MT5000 CD/DVD Slot Car Phone Mount. Our desks seem to collect more and more gadgets, wires, papers and other stuff. But how handy would it be if we could combine a couple devices. We found this little 4 port USB hub that is small and has a way to store the USB cable so that you can even take it on a trip and it has a stand for your mobile phone build in. As normal with a USB Hub you just can plug in up to 4 devices and on the top you can unfold a little shelve agains witch you can rest your cellphone while it stand securely in the bottom groove. 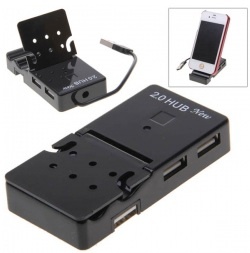 This USB HUB can be the an easy way to clear some of you desk. Come see all the info and pictures of this USB HUB / Phone Stand. 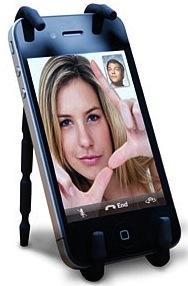 This holder for your iPhone, Blackberry or Android phone is simple and amazingly versatile. 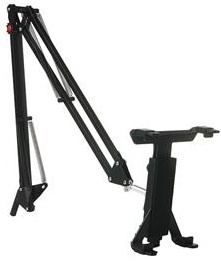 You can bend any of the 8 legs in ways that construct the perfect stand or holder. For instance fold it around you phone and then use the other legs to make it to the AC vents of you car. Now you have a car holder. Or you can bend it to connect it to your bike or a stroller. And you can of course make it like a stand to use at you desk. Options of this phone holder are limitless just try and see what you can come up with. Come and have a look at this Spider Mobile Phone Holder. Why get an ugly plastic stand for the tablet that looks so good. Now you can have a stand made out of wood, this one is made out of redwood and that would look so much more professional on your desk. The stand is designed for the iPad but that does not hold you down if you have a different tablet. Although I can’t tell you for sure that it will work with different tablets there are reviews of people using it with different tablet and ebook readers like the kindle. 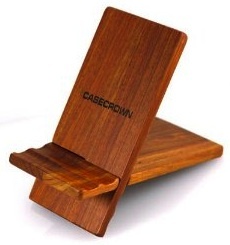 Just go check out all the details and customer reviews of this Wooden Tablet Stand.